The Carbon Series Ford GT, which is the line Scott Dixon bought his GT from. Certain people in this world are allowed to make a wide path around the rules, no matter how strict they might be. But when it comes to the current generation of the Ford GT supercar, not a soul is above the rules—not even the people who race the car for a living, or who have won their class at 24 Hours of Daytona in it. Five-time IndyCar champion Scott Dixon recently did an interview with Robb Report, where, as wealthy people with fancy cars often do, he talked about his wealth and a fancy car. But the best part of the interview wasn’t that. It was how Dixon, who won the GTLM class at the famous 24 Hours of Daytona in a Ford GT race car last year, said even he had to apply for the privilege to buy a $500,000 Ford GT street car. 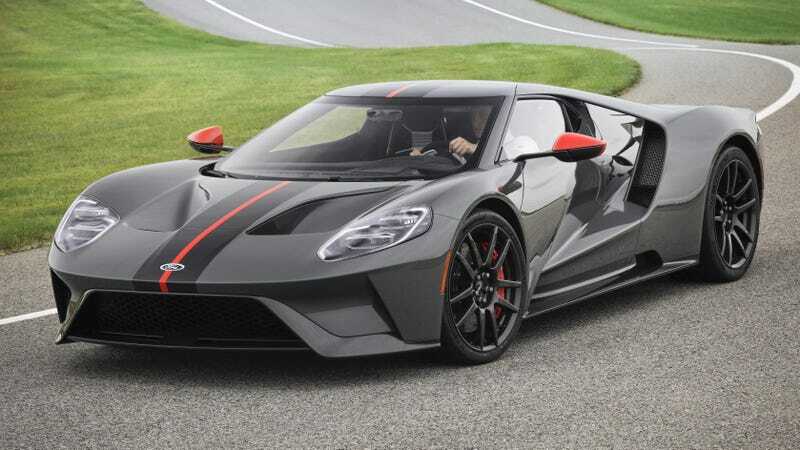 You see, the new GT comes with a couple of stipulations for anyone interested: They have to be able to drop at least $450,000 on it, agree not to resell it with the first two years of ownership, and, before any of that, they have to apply for the honor to purchase the car at all—even people like Dixon. Dixon got the OK from Ford, to no one’s surprise. He told Robb Report he ended up buying a white Carbon Series Ford GT and said, “Man, that’s a lot of money” when the bill came—something the rest us exclaim when we check out at the grocery store. But, you know, at least we didn’t have to apply to go there.